Over 2,000 pages of documents related to the murders of Shanann Watts and her two daughters were released late Wednesday afternoon by the Weld County District Attorney's Office. DENVER -- Over 2,000 pages of documents related to the murders of Shanann Watts and her two daughters were released late Wednesday afternoon by the Weld County District Attorney's Office. The release of the documents comes three days after Watts was sentenced to three consecutive terms of life in prison without the possibility of parole for killing his pregnant wife and their two young daughters, Bella and Celeste; two more concurrent life sentences for two other murder charges – first-degree murder by a person in a position of trust – for the murders of Bella and Celeste; as well as three 12-year sentences for separate counts of tampering with a deceased human body for killing his pregnant wife and their two young daughters. The 2,000+ page report begins by detailing the day police came to the Watts home and began to search for Shanann and her two daughters. According to Frederick police, after Watts had given police permission to search the home, he came up to officers and handed them Shanann's wedding ring, which he said he found on a nightstand. Once police found Shanann's phone, Watts wasn't able to provide them with the password to unlock the device, so Shanann's friend, Nikole Atkinson, the woman who first called police when Shannan went missing, gave them that information. The report states that while police were searching the family home, "Shannan's mother called during this time and was adamant that Christopher had done something and that I (the detective in the case) needed to check the GPS on his truck." According to the report, Shanann's family suspected Watts from day one. "She (Shanann's mother) and her husband believe that her daughter and granddaughters' disappearance involved, "foul play," and that she honestly believes that her son-in-law was involved," the document states. The report also states that Atkinson and another neighbor, Nathaniel "felt Christopher was extremely nervous." At one point, Nathaniel said "he had heard Christopher numerous times in the past yelling loudly at Shanann." It wasn't only neighbors who saw a change in Watts' personality. The report shows that Shannan's mother told police that Watts was acting "weird and out of the ordinary," and that Watts was telling people that he "had to go to work," during the disappearance of his family, something the mother told police "doesn't seem right." When asked why bed sheets weren't on their bed the day the family went missing, Watts reportedly told police "she (Shanann) usually jumps into bed after being in the airport and will wash the sheets the next day to get the airport smell off them." During a revealing moment in the investigation, Watts told police Shanann was in North Carolina for five weeks before he traveled to the state, but said "there was a disconnect and they fell out of love for each other," the report states. It continues, "he (Watts) said when they were together again the last week it just wasn't the same. Chris felt like they weren't in love anymore. Chris said he could never be himself or be who he was before he met her." The report further states Watts told police it was "'totally possible' she (Shanann) was seeing someone else." As the search in the family home continued, Frederick police recovered a book titled "Hold Me Tight," a book about building loving relationships; and which the District Attorney said was found in a recycle bin after Shanann gave it to Watts to work on their marriage, according to the report. A gender reveal party that was supposed to take place at around the time Shannan and the girls went missing was also canceled, according to the report, because "the energy wasn't right." The following is a text conversation between Shanann and a friend named Taylor about the gender reveal party. During a phone conversation with a friend, the report shows Shanann said to her that "Chris didn't want the baby she was pregnant with and that he was scared. He was happy with having only the two girls" and that after Shanann came back from North Carolina that "Chris came back to Shanann a different man." 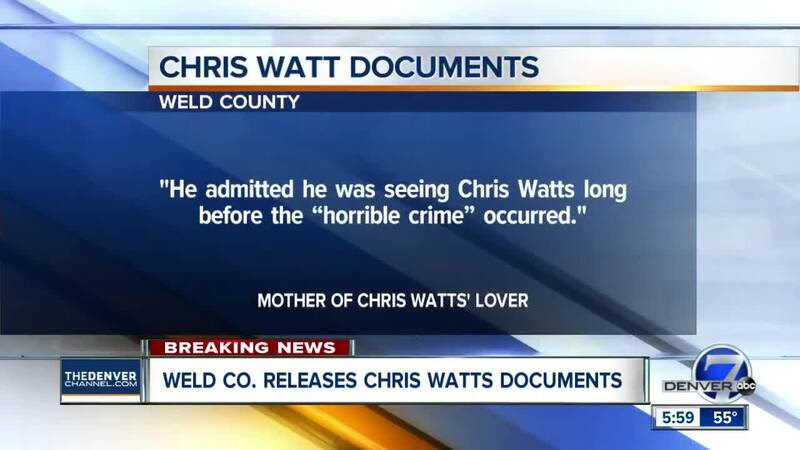 During an exclusive interview with our partners at The Denver Post before Watts' sentencing, a woman by the name of Nichol Kessinger told the newspaper she had been dating Watts about a month before he confessed to the murders of his pregnant wife and their two girls. Kessinger, believing Watts was at the end of divorce proceedings, would soon find out that wasn't the case -- and that the man she had been dating was a completely different person from the soft-spoken man and a thoughtful father she thought she knew. In the discovery report released by the Weld County District Attorney's Office, more information about went on between Kessinger and Watts during the week of the family's disappearance and his eventual arrest was revealed. Kessinger, speaking to a Colorado Bureau of Investigation official on August 17 said she recalled a conversation between her and Watts the day the family was reported missing. In the interview, she said she and Watts "facetimed" and that during the conversation, she became suspicious about comments he made after noticing Watts was lying on a mattress that did not have any sheets on it. The report shows Watts said "he was cleaning his home and trying to keep busy to keep his mind off of things." In the interview, Kessinger recalls also going to Watts home in the middle of July and asking him why he would want to leave his wife. Watts' response was that "they tried working on their relationship and it wasn't working," additionally saying he described his relationship with Shanaan "as a contractual agreement and not emotional." The report states Kessinger found out Shanann was pregnant via reports from news media, something she didn't know prior. "Nichol thought if he could lie to her about this, what else would he lie about," the report states. After finding out about Shanann's pregnancy, Kessinger confronted Watts about it, telling him he should focus on his family, according to the report. Watts then asked her if "this ruins everything with their relationship," at which point Kessinger confronted him again and told him to stop lying. According to the file, the latest revelation about Watts made her think Shanann was in danger, creating a feeling of discomfort toward Watts. She told CBI that "it was the hurt that made her delete all (records of him from her phone) and it was the lie that made her come forward (to authorities)." In another conversation with Watts, Kessinger told CBI he told her the night of Aug. 12 (a day before the girls and Shanann were reported missing) that "he had to go to the field, not the office, on Monday morning," as he had to "check on a valve where where was a "release."" Kessinger would eventually start to become suspicious of Watts, as she said he did not "seem to be concerned as he should be (about his wife and their daughters) and he was more concerned with their relationship." She then reportedly told him to contact her only after his family was found safe. Speaking to CBI, Kessinger said she saw the interview with Watts on T.V. and said "his eyes looked different and it looked like he did not have a soul. She said he looked like a different man." In one of the last statements she gave law enforcement, Kessinger said Watts' financial situation, the fact that Shanann and Watts were not getting along and the arrival of a third child is what contributed to the murders. According to the report, Kessinger felt money was the biggest catalyst for what happened the day of the murders. The discovery reports also details an alleged relationship Watts had with a man during a 10-month period from about June 2017 to March or April of 2018. In the report, the man said their relationship was "off and on" before he ended it after finding out Watts was married with kids. The man said in the report Watts told him "he was the victim of emotional and mental abuse and was stuck in loveless marriage but was so scared to leave because of Bella and Celeste." In an interview with the man's mother, it is revealed that the man admitted to his mother that he was seeing Watts "long before the "horrible crime" occurred." She also told police that her son told her Watts paid him $250, $80 and $60 on separate occasions and that one "one of the payments was for the man's lip injections." According to the report, the man told his mother that any of the payments made by Watts were not related to prostitution. Denver7 is going through the report and will update this story as we learn more.